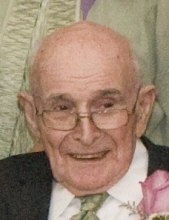 Joseph F. McCoy,91 of Ashland, PA beloved husband, father, grandfather and great grandfather passed peacefully January 16, 2019 at Lehigh Valley East Hospital Pottsville, Pa. He was born July 22, 1927 in Raven Run, Pa, and was the husband of Helen McCoy (Reilly) for 64 years and the son of the late Joseph and Mary McCoy. He was a graduate of West Mahony Township High School and entered the United States Army in 1946 and was honorably discharged in 1947. He was employed by State Equipment Company many years retiring in 1992. He was a member of St. Charles Borromeo Parish, Ashland, Pa, Ashland Elks, Knights of Columbus and Operating Engineers Local #542. In addition to his wife, Joseph is survived by daughters Mary Wood (Jack) Catasauqua, Pa, Ellen Sutjak (Bob) Slatington, Pa and Sheila Zeplin, Cary N.C., Grandchildren Shawn Zeplin, (Jennifer), Keith Zeplin (Shannon), Kathleen Eckinger (George), Kelly Martinelli (Kyle), Robert Sutjak (Amanda), Matthew Sutjak (Caitlin), Kevin Sutjak. Great Grandchildern Carson, Annabelle, Hannah, Adeline, Everly, Luca. Also survived by sisters Peggy Carroll (Charlie) Northumberland, Pa, Sally Egan (Paul) New Philadelphia, Pa, Sister in law Diane McCoy Florida. Many brother and sister in laws and nieces and nephews. He was preceded in death by son in law Rod Zeplin, brothers Jack McCoy and Jim McCoy, sisters Annabelle Skonecki, Mary Coughlin and Eileen Gownley. In lieu of flowers contribution can be made to St. Charles Borromeo Parish, Ashland, Pa.
A Mass of the Christian Burial will be 11:00 AM Tuesday, January 22, 2019 at St. Charles Borromeo Parish, Ashland with Rev. Paul Rothermel officiating. Interment in Annunciation BVM Cemetery, Shenandoah, PA. Viewing 6:00-8:00 PM Monday, January 21 at the Kull-Heizenroth Funeral Home, Ashland and 9:30-10:45 AM Tuesday, January 22 at the St. Charles Borromeo Church. Kull-Heizenroth Funeral Home Inc. is in charge of the arrangements. Charles Heizenroth III, Supervisor. To send flowers or a remembrance gift to the family of Joseph F. McCoy, please visit our Tribute Store. "Email Address" would like to share the life celebration of Joseph F. McCoy. Click on the "link" to go to share a favorite memory or leave a condolence message for the family.